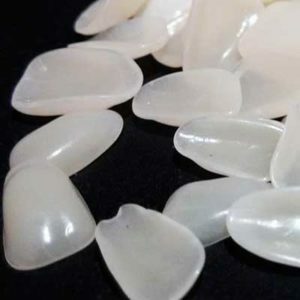 Dental veneers are thin shells that are placed and bonded to a tooth, improving the color and functionality of the tooth. 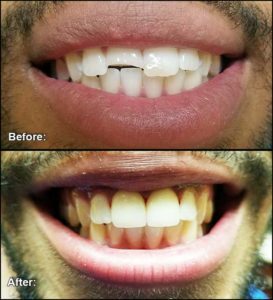 Below are picture of dental veneers before and after for a patient that chipped his front teeth that we were able to help fix with the installation of a porcelain veneer. For great looking veneers installed by an experienced dentist that has been helping patients since 1972, schedule an appointment with the Oxnard dentist with over 45 years of experience – Carson & Carson, DDS (805) 983-0717. If you are interested in the thinner alternative to veneers, we also offer lumineers at a slightly higher cost at Carson & Carson , DDS. If you have a chipped or misaligned tooth or have discoloration due to a recent oral surgery or a have poor oral hygiene from common lifestyle activities such: as smoking, drinking dark sodas or coffee, or advanced age, then dental veneers can be an easy and cost effective cosmetic dental solution. Veneers are not recommended for patients who grind their teeth at night because they are thin and can crack or break as a result of tooth grinding over time. The cosmetic dentistry specialists at Carson & Carson DDS. have years of experience using porcelain dental veneers to treat patients and bring back a bright white smile. (805) 983-0717. When done properly, Dental Veneers look natural and are indistinguishable from your natural teeth. Dental Veneers are molded to your teeth so that they are sized to fit your teeth comfortably and work with your specific dental needs. Porcelain Veneers are tolerable with your gums, and more tolerable than older composite veneers. If you have a tooth that is resistant to whitening or would like to have a more permanent solution for whitening your teeth, veneers can offer an affordable, long lasting solution. The first step that we take when assessing a patient for dental veneers is diagnosing the patient. This includes examining your teeth and then discussing the cost of veneers with you & whether or not they are a good cosmetic solution for your issue. We may also make impressions of your teeth or take a CT scan or x-rays. We will talk with you about the process, the cost, and which teeth would be good candidates for this procedure. Worried about the cost of Porcelain Veneers? Find out more information on the average cost of Porcelain Veneers. The next step is to prepare the tooth (or teeth) for the dental veneer. The enamel of the tooth will be trimmed down to make room for the veneer. An impression of the tooth is taken which will be used to custom create the veneer. After the dental veneer is created, we will place it on the tooth and assess the color and fit. Some additional trimming of the veneer may be necessary for optimal comfort. We apply a special cement to the veneer that, with the help of special light beam that activates special chemicals in the cement, will bond the veneer to the tooth’s surface. The final step is removing any excess cement, evaluating your bite, and making small final adjustments. After a small period of a couple of weeks, we ask our patients to schedule another appointment so that we can make sure the veneer fits comfortably. Get Veneers today! The Oxnard Dentist with over 45 years of experience at Carson & Carson, DDS is always available to talk with you about dental veneers, the process, cost, and whether it is a viable option for your dental needs. Call (805) 983-0717 today and make an appointment with one of the best cosmetic dentists in all of Ventura County at Carson & Carson, DDS. 24/7 availability for dental emergencies. Same day appointments available.